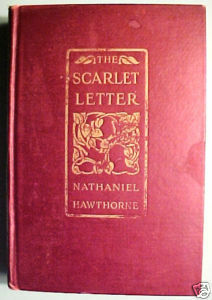 THE SCARLET LETTER BY NATHANIEL HAWTHORNE Book Description: 1929, 1929. First Edition. Houghton Mifflin Co.; Riverside Press. 312 pages. GOOD; no DJ b w frontispiece: "STANDING ON THAT MISERABLE EMINENCE" Victorian edition of Hawthorne's classic about adultery in a New England village. Story of Hester Prynne, and a sharp view of morals and ethics in old New England. Starts with Hawthorne's autobiographical "The Custom House." With an introduction by George Parsons Lathrop. PREFACE TO THE SECOND EDITION, DATED MARCH 30, 1850. Hawthorne was born July 4, 1804, in Salem, Massachusetts, the son and grandson of New England Seafarers. He lived in genteel poverty with his widowed mother and two young sisters in a house filled with Puritan ideals and family pride in a prosperous past. His boyhood was in most respects, pleasant and normal. In 1825 he was graduated from Bowdoin College in Brunswick. Maine. He returned to Salem to be a writer of short stories. For nearly twelve years he was plagued by self doubt worry. His marriage to Sophia Peabody was a happy one . Finally, he found a measure of success with some of his short stories. Now he is considered one of the better writers of that time. THIS WOULD BE A GREAT EDITION TO YOUR VINTAGE BOOK LIBRARY. THE maroon BOARD COVERS ARE EMBOSSED WITH title AND FLOWERS. SPINE HAS GILT TITLE with gilt tree. SPINE AND CORNERS HAVE MINOR SCUFFING/BUMPING. BOARD FRONT HAS FADED SPOTS. SMUDGE ON BOTTOM OF FFEP.